Life Unexpected: A means to fueling your toddlers imagination! Watching Leo run around, dropping to the floor and crawling into the secret hiding place behind the sofa puts a big smile on my face. Watching him enjoying his play time, and using his imagination to find the nooks and cranny’s throughout the room that only a toddler could possibly find makes that smile more prominent, and as Leo gallivants around, jumping and spinning around until he is so dizzy he falls to the floor, I got to thinking about play tents and tunnels, and he much Leo would love one of his very own. 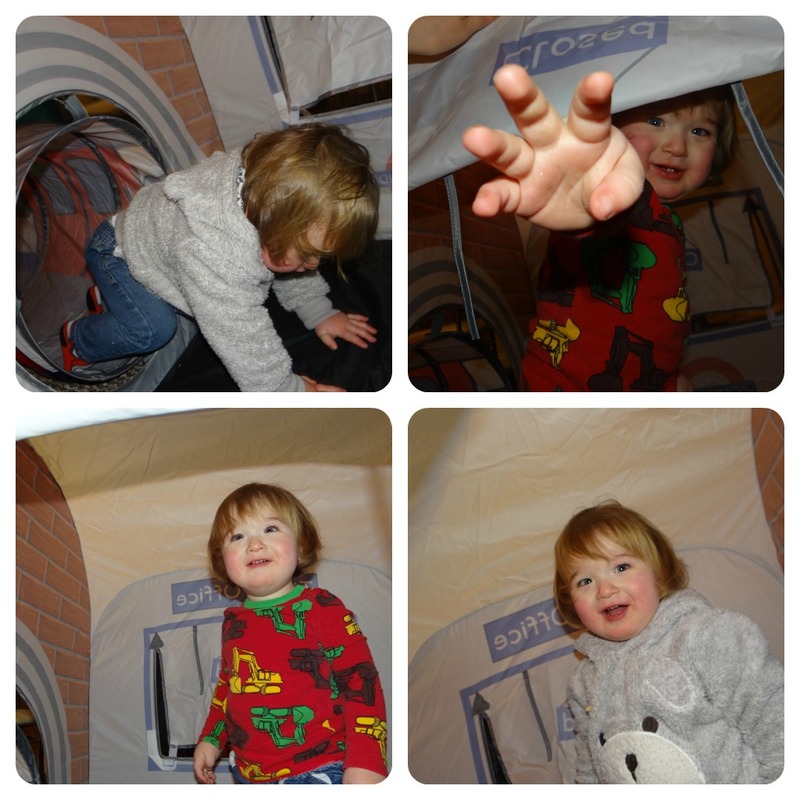 With Christmas on the ever expanding horizon, play tents are going to be on a number of children’s bulging Christmas lists this year, and Leo is no exception to this rule (even though I have written Leo’s letter to Santa myself!) So I have been tasked with researching play tents in order to find one that is resilient enough to withstand my Tasmanian toddler. The Monster Factory have very kindly sent Leo their very popular Tube and Station Play Tent to have a serious play with just in time for the festive season. Now that the weather is at the expected winter temperatures and the forecast always seems to be predicting rain, it is hard to get outside to let Leo burn off all of his energy, but I seem to have found the solution to our problems, in the form of the very imaginative Tube and Station Play Tent. The play tent is themed around a London tube station and even features a tunnel designed as a tube. The front of the tunnel has a panel with the front of the train printed on it; this panel lifts up so that the kids can crawl as fast as their little legs will carry them, through the tunnel and into the train station. 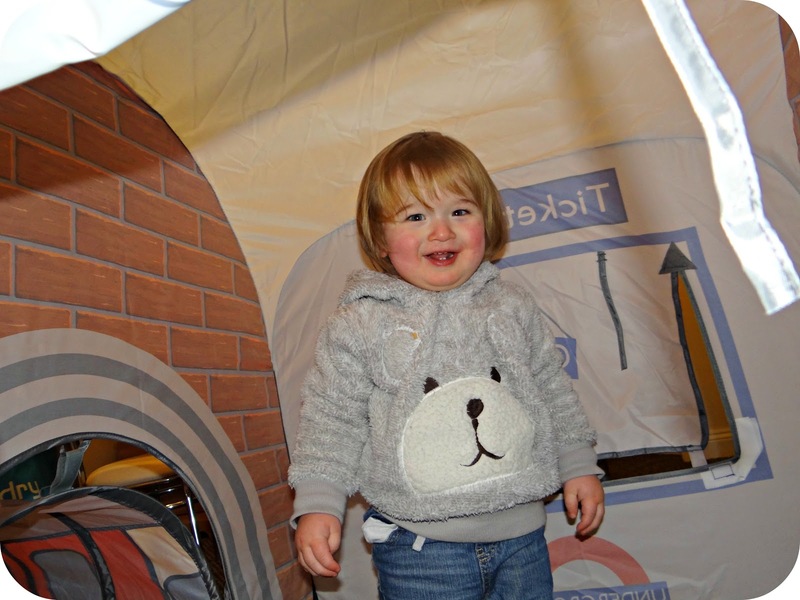 The outside of the play tent is designed as a ticket office on either side, so that little one’s can let their imagination run wild and really get into their new play roles. I have found the attention to detail on the art work surrounding the tent brilliant and love that it even boasts the ‘London Underground’ logo on the sides. While Leo was down for a nap I got the contents of the tent out of the box and set it all up ready for my little man to play with after his afternoon snooze. Getting the tent and tunnel set up is easy and takes minutes; the tent itself has a ribbon keeping it tied down, and with the removal of the ribbon the tent begins to pop up. With the tent now upright all you need to do is feed the roof pole through the tab, and viola…You have a train station fit for a king, if of course a king should need to catch a train! The tunnel is kept in place via Velcro straps, and when you un-strap them you are presented with your tube as it pops up in front of you. The tunnel is then fastened to the station with the same Velcro straps through designated hoops that keep the station and the train together during energetic toddler playtime. With the sounds of Leo awakening, it was time for him to come face to face with his new train and station and his reaction was just as I had hoped it would be. 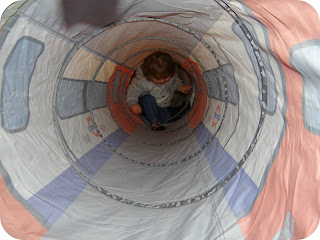 Leo was over the moon, I got down onto my all fours and showed Leo how to get into the tent by crawling through the tunnel (yes I really did, I regressed!) followed closely by Leo. I then sat inside the play tent while Leo crawled back in and out of the tunnel with a massive smile plastered all over his face. Then he decided to go through the window and back through the tunnel and when it was time to get out for dinner, he got down from the table and ran back inside with what was left of his Burrito wrap despite my greatest effort to catch him before he disappeared into the tunnel. He then sat in the station munching the remainder of his dinner staring out at the rest of us through the window while grinning cheeky smiles at us all. With the weather at the moment being far from desirable we have not set the tent up outside yet, but in the Summer we will most certainly be having it out in the garden so that Leo can have a run around and get the very most out of it. What I do want to discover is just how waterproof it actually is, but this is something I will have to share with you at a later date, once we have endured a rain shower in the Spring. 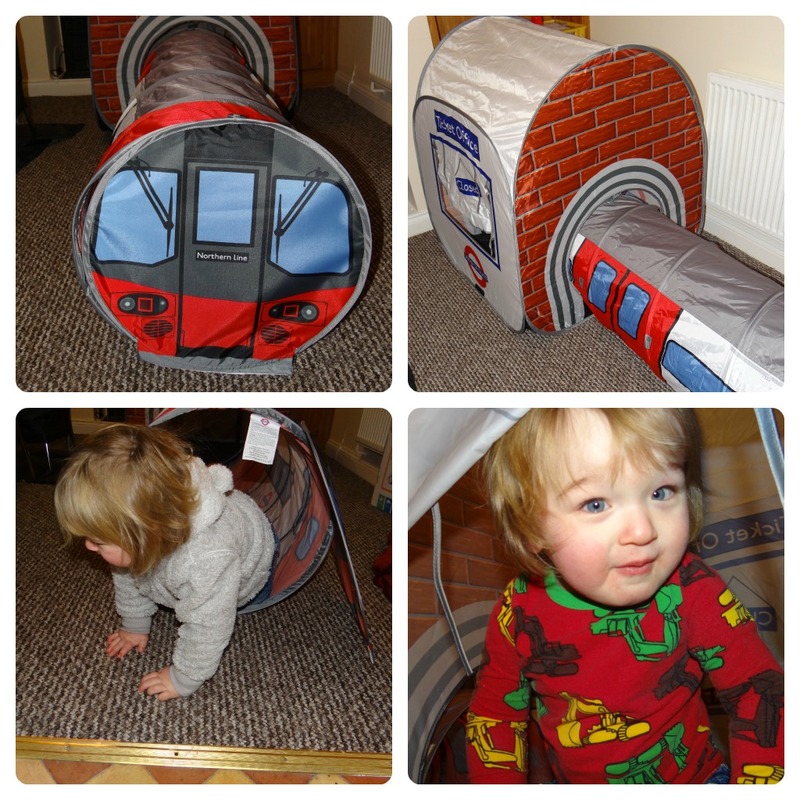 Over all I think this tent and tunnel set is brilliant and completely different to any other play set on the market. It is sturdy and has withstood Leo’s enthusiastic playing, it has kept him entertained, and as he gets older I know he is going to have hours of fun in there, I cannot wait to get his little friends over so they can all have a play in the station. It is going to be perfect for the Summer when we have friends with children over and I look forward to seeing Leo’s imagination develop and the games he will play. Santa is bringing Leo his very own cash register and I don’t think it will be long before Leo is sat behind the ticket booth taking money off all of the customers wanting to travel on his railway. 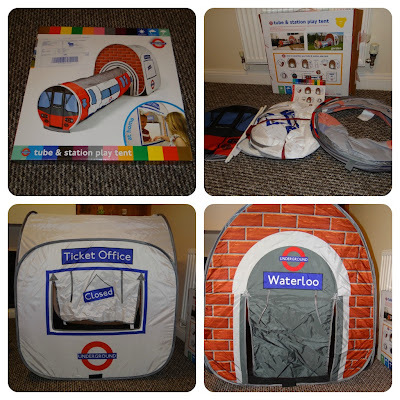 The Tube and Station Play Tent retails at £59.99 which is at the steeper end of the market but the quality is brilliant. The artwork presented on the tent and the tunnel sets the basis for children’s imaginations to really take off and it looks set to last, unlike other tents that fall apart after a short while. Not to mention the great features of the UV protection and waterproof properties that many children’s tents do not boast. The Monster Factory also have a number of other creative tents in the form of a full London Underground train and life size VW Camper Van tents, they really are fascinating and make the mind boggle! Make sure you check out The Monster Factory for those unusual gifts this Christmas. You can follow The Monster Factory on Twitter at @MonsterFactry and on Facebook. 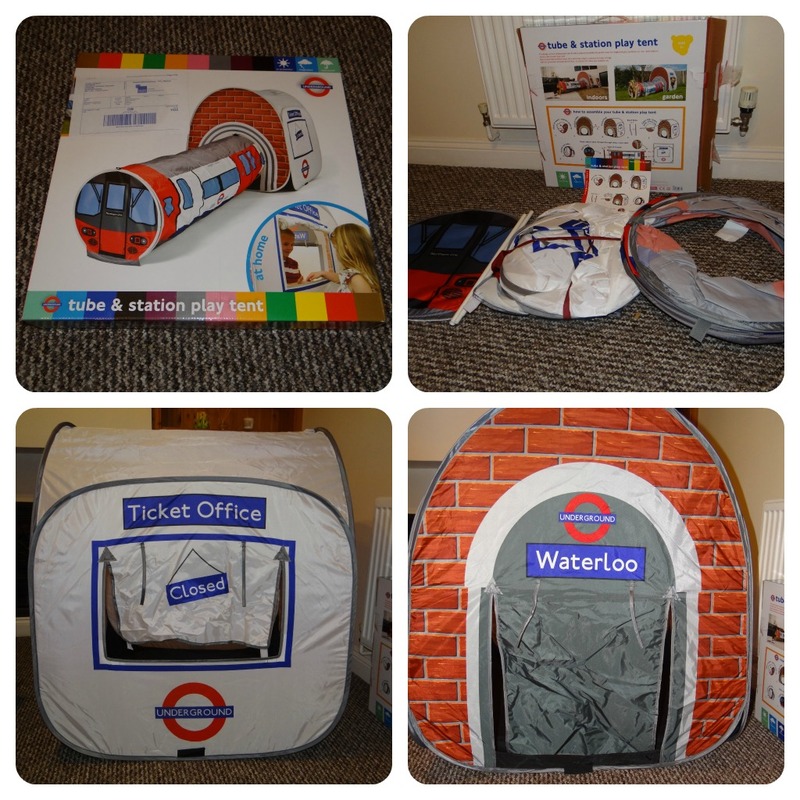 Disclaimer: I was sent the Tube and Station Play Tent for the purpose of this review, however all views and opinions expressed are completely honest and my own.